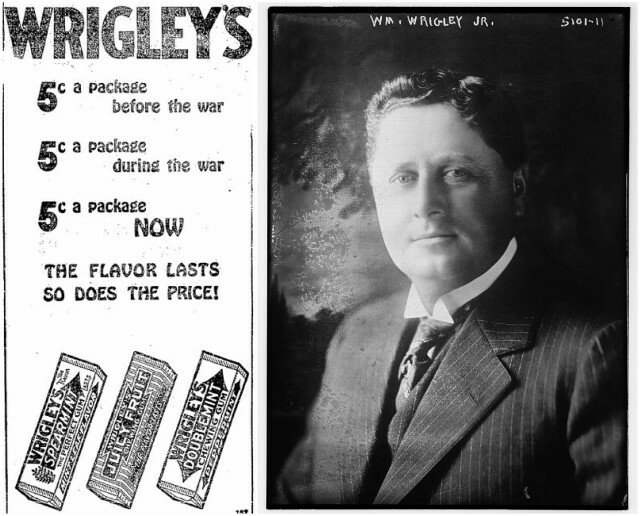 William Wrigley Jr. was born in Philadelphia, Pennsylvania on September 30th, 1861, at the height of the Civil War. He was the son of William and Mary A. Ladley. His father was the founder and president of the Wrigley Manufacturing Company. The main product of the company was Wrigley’s Scouring Soap. Even in his early years, William Wrigley Jr. was interested in his father’s soap business and when he was 13 years old, he became a soap salesman for his father, selling soaps from a basket in the streets of Philadelphia. 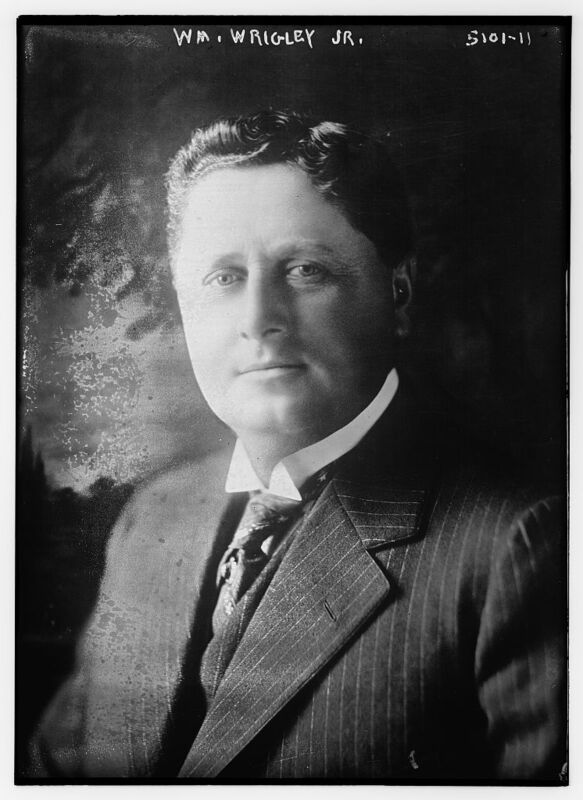 In 1891, when William Wrigley Jr. was 30 years old, he moved to Chicago with his wife Ada and their young daughter Dorothy, opening a new branch of his father’s company where he continued to sell soap and offered baking powder as a premium. He soon realized that baking powder became a huge hit as a freebie and that customers were more interested in getting baking powder than soap, so he and his partner decided to switch to baking powder business. Now baking powder became the primary product of William Wrigley Jr. Company, but he also offered gum as a premium. As baking powder’s popularity used to surpass that of the soap, so did the chewing gum packages offered with every baking powder became more popular than the baking powder itself. Wrigley soon abandoned baking powder, entered the gum industry and in 1893, he offered two new gum brands, Juicy Fruit and Wrigley’s Spearmint. Since the chewing gum business was highly competitive in the late 1800s, William Wrigley Jr. spent more than a million dollars a year in advertising. He combined gum with other items like lamps, pocket knives, cookbooks and fishing tackle. 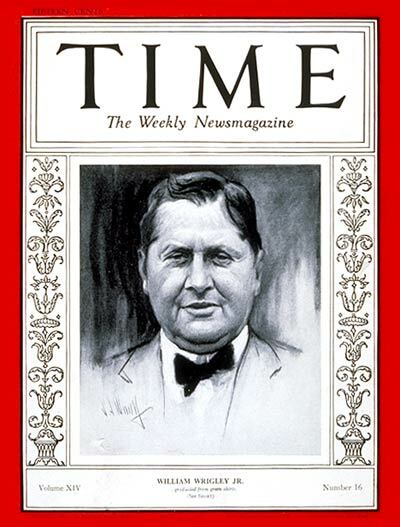 William Wrigley Jr. on the cover of Time in 1929. In 1907, during the economic depression, Wrigley showed that he was prepared to take a risk, mortgaging everything he owned in order to launch a massive advertising campaign. The gamble paid off and by 1908, sales of Wrigley’s Spearmint were more than $1,000,000 a year and in total, the general sales for the company leaped from $170,000 to $3 million. Wrigley was a master of advertising and in 1915, the Wrigley Company kicked off a campaign in which it sent free samples of its gum to a total of more than 8.5 million Americans listed in phone books. He also started another campaign and every child received two sticks of gum when they turned two, reaching 750,000 children. 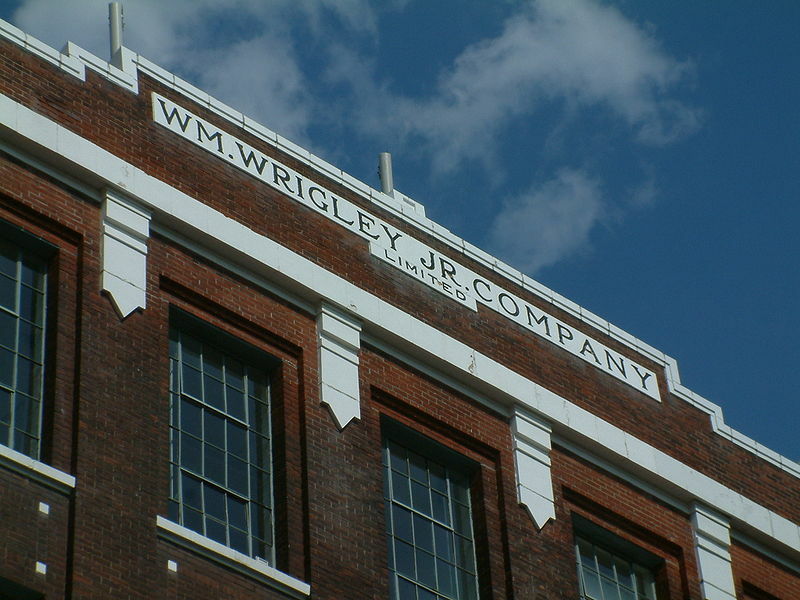 Soon Wrigley became the biggest gum manufacturer in the world and established gum companies in Canada, Australia, Great Britain and New Zealand. William Wrigley Jr. died on January 26th, 1932, at the age of 70 and his son continued to run the company.